Even though most people think of ships when they think of the U.S. Navy, like all branches of the military, it has land and air vehicles as well. Navy aircraft are so complex that there are different mechanics who specialize in different types of repairs. The Aviation Structural Mechanic - Safety Equipment (AME), maintains and repairs utility systems throughout the aircraft. 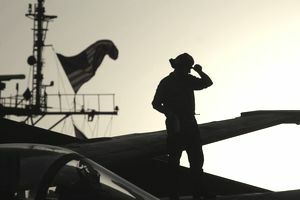 These sailors work on systems such as air conditioning, heating, pressurization and oxygen, plus multiple safety devices. These technicians may also volunteer to fly as Naval aircrew. Aircrew performs numerous in-flight duties and operate aircraft systems in turbo jet, helicopter or propeller aircraft. They're tasked with maintaining the various aircraft systems such as seat and canopy ejection, gaseous and liquid oxygen, life raft ejection, fire extinguishing, air conditioning, cabin and cockpit heat, pressurization and ventilation. This rating (which is how the Navy refers to its jobs) is responsible for removing and installing oxygen system valves, gauges, converters and regulators, and inspecting, removing, installing and rigging ejection seats, shoulder harnesses, lap belts and face-curtain mechanisms. In addition, they perform daily, preflight, postflight and other periodic aircraft inspections. Aviation structural mechanics may be assigned to sea or shore duty any place in the world, so their working environment varies considerably. They may work in hangars or hangar decks or outside on flight decks or flight lines at air stations. A high noise level is a normal part of their day-to-day working environment. AMEs work closely with others, do mostly physical work and require little supervision.They may also serve as flight engineers aboard certain aircraft. After Navy boot camp at Great Lakes in Illinois, you'll spend a little over a month in technical training (or as the Navy calls it, "A-School") at the Naval Air Station in Pensavola, Florida. As with any new military recruit, you'll take the Armed Services Vocational Aptitude Battery (ASVAB) tests before you're assigned a job. For this position you need a combined score of 210 on the verbal (VE), arithmetic (AR), mathematical knowledge (MK) and auto and shop information (AS) segments. Alternately you could score a combined 210 on the VE, AR, MK and mechanical comprehension (MC) segments. Unless you volunteer for aircrew duty, there is no Department of Defense security clearance needed for this job. In addition, your vision must be correctable to 20/20 with normal color perception (no colorblindness), and you must have normal hearing. You have to be a high school graduate and have no history of drug abuse.